In an era of economic analysis hyperactivity, Paul Krugman debunks another economic doctrine! It appears, from a sociological perspective, that it is reasonable to assume that wealthy corporations and wealthy individuals oppose government job creating spending increases for the simple fact it reduces their already substantial political influence. The basic notion: if the government is a significant job creator, and folks broadly are employed and successful, it reduces the influence of the wealthy….thus all the phony money-driven economic theories about the harm of government incentive spending. 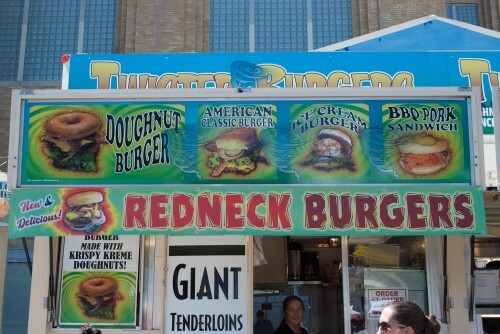 An amazing article (by a MD, no less) on food at the Indiana State Fair. Warning: Read only with preferred indigestion medication in hand! By the way, it seems to be an excellent health care blog…thanks to John Phipps. I continue to publish blogs and articles on climate change because the scientific projections are personally frightening…my grandchildren will experience a much changed climate. For some insight on Owning Nashville…a new Exchange Traded Fund based upon equity in Nashville based corporations. ETFs offer public investors an undivided interest in a pool of securities and other assets and thus are similar in many ways to traditional mutual funds, except that shares in an ETF can be bought and sold throughout the day like stocks on a securities exchange through a broker-dealer. Unlike traditional mutual funds, ETFs do not sell or redeem their individual shares at net asset value, or NAV. Instead, financial institutions purchase and redeem ETF shares directly from the ETF, but only in large blocks, varying in size by ETF from 25,000 to 200,000 shares, called “creation units”. Purchases and redemptions of the creation units generally are in kind, with the institutional investor contributing or receiving a basket of securities of the same type and proportion held by the ETF, although some ETFs may require or permit a purchasing or redeeming shareholder to substitute cash for some or all of the securities in the basket of assets. If there is strong investor demand for an ETF, its share price will (temporarily) rise above its net asset value per share, giving arbitrageurs an incentive to purchase additional creation units from the ETF and sell the component ETF shares in the open market. The additional supply of ETF shares reduces the market price per share, generally eliminating the premium over net asset value. A similar process applies when there is weak demand for an ETF and its shares trade at a discount from net asset value. Either is an index fund, or discloses each business day on its publicly available web site the identities and weighting of the component securities and other assets held by the fund. The SEC rule proposal would allow ETFs either to be index funds or to be fully transparent actively managed funds. Historically, all ETFs in the United States have been index funds. In 2008, however, the SEC began issuing exemptive orders to fully transparent actively managed ETFs. The first such order was to PowerShares Actively Managed Exchange-Traded Fund Trust, and the first actively managed ETF in the United States was the Bear Stearns Current Yield Fund, a short-term income fund that began trading on the American Stock Exchange under the symbol YYY on 25 March 2008. The SEC rule proposal indicates that the SEC may still consider future applications for exemptive orders for actively managed ETFs that do not satisfy the proposed rule’s transparency requirements. Some ETFs invest primarily in commodities or commodity-based instruments, such as crude oil and precious metals. Although these commodity ETFs are similar in practice to ETFs that invest in securities, they are not “investment companies” under the Investment Company Act of 1940. Publicly traded grantor trusts, such as Merrill Lynch’s HOLDRs securities, are sometimes considered to be ETFs, although they lack many of the characteristics of other ETFs. Investors in a grantor trust have a direct interest in the underlying basket of securities, which does not change except to reflect corporate actions such as stock splits and mergers. Funds of this type are not “investment companies” under the Investment Company Act of 1940.